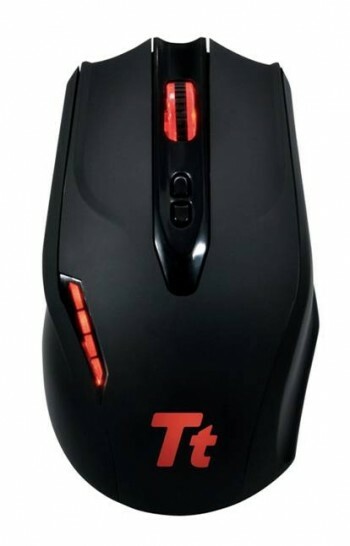 Review: Thermaltake Black Gaming Mouse | OhGizmo! Thermaltake is a very well-known computer hardware company, and although they are most commonly recognized for their computer tower cases, they also have their own line of gaming peripherals for the PC. The company just recently rolled out these new additions to their hardware resume, and we were lucky enough to get a few pieces of this equipment in for review. 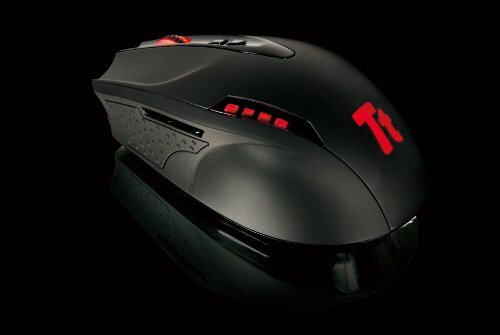 The first up – the Thermaltake Black Gaming mouse. Let’s see how it performed. The first thing I noticed about this gaming mouse is how light it feels. The peripheral has almost no weight to it. I found that the mouse does come with weights already installed into its chassis, but they don’t provide much of a resistance when using it. I was able to slide the mouse across the desk with ease, and even pick it up with no effort. This was an issue for me, only because I like my mice heavy and stout. It’s real easy to shift the mouse all over the desk if you’re not careful. The Black looks, however, extremely slick and modern. With matte and black gloss styling, the mouse makes a perfect addition to my desktop environment. It has red LEDs that light up when the PC is powered on, which makes it look even more like a mean, down-to-business mouse. Perhaps one of the best aspects of the aesthetic that the Black puts on is the thumb grip. Ridges on the left side of the mouse make for an easily-accessible grip that is very comfortable. With a braided cable, the mouse surely knocks it out of the park with looks. In terms of performance, the mouse is hit and miss. The cool thing about the Black is that right below the scroll wheel lies the DPI buttons, to change the sensitivity up and down. The great thing about this mouse is the ability to click up – and back down. Most gaming mice make you cycle through the available settings over and over again, whereas the Black allows you to go back and forth until you find the right setting for you. 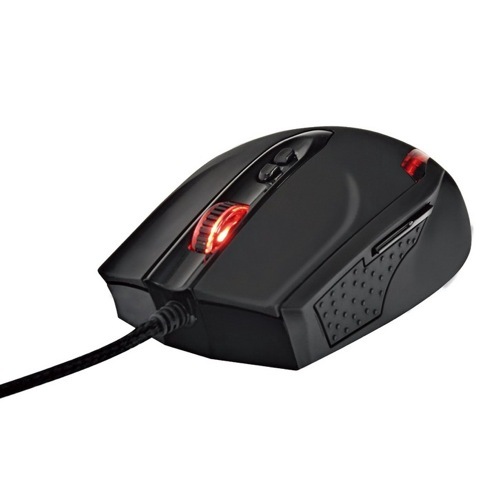 Cycling from 200, 800, 2000, and 4000 DPI, the mouse makes these options easily available. The problem with the above mentioned DPI settings is this: these are the only settings. There’s no option to fine-tune the DPI, nor is there software available to change the settings. It would be great to have this option available, because I found myself constantly switching back and forth between 2000 and 4000 DPI until I finally settled with 4000. It becomes frustrating sometimes. The forward and back buttons work perfectly, and most of the time the Black is spot-on when I need it. There’s honestly not too much to complain about. I would honestly say that the Thermaltake Black gaming mouse is solid, but not something I would dump a lot of money into. Right now the mouse is available anywhere from $40 to $60 online, which isn’t too bad. If you happen to pick this mouse up, it will do the job, but it won’t be a crucial piece of hardware to have and I can see consumers swapping out sooner than later. While gaming the mouse did it’s job, but it did only that. With the prices I’ve seen for the Black, you’ll be paying for aesthetics and possibly comfort. If you’re okay with that, then go ahead and pick it up. Other than that, I would say continue looking. The mouse whit all the weights in, it is not light, 22,5g without the actual weight of the mouse.